As supplies of the wild yeast dwindle, recipes are being tweaked and brewers prepare for "dark, less funky times" ahead. Chad Yakobson, of Crooked Stave, stares longingly at his dwindling supply of Brettanomyces. Brewers around the country are quickly running out of the wild yeast. Photo by Haydn Strauss. After years of worrying about the possibility, and desperately seeking a solution to avoid the worst possible outcome, brewers in all nations are preparing for a world-wide Brettanomyces shortage. Recipes are being tweaked in advance. Entire barrel programs are being abandoned. And there's been an uptick in research related to creating a synthetic yeast to replace the genuine article. "We always hoped to avoid this day," says Chad Yakobson, the founder of Crooked Stave Artisan Beer Project in Colorado. "Thankfully we have our 'clean' beer program to fall back on. But, when the last of the Brett goes, it'll be a sad day. I'll pour a bit of Helles lager out onto the brewery floor for our fallen friend." The wild yeast strain is long associated with lambics, coolship fermented beers, and barrel aged concoctions. It's known for esters and flavors ranging from the often-used "barnyard" term and horse blanket, to spicy pepper and fruits like cherry and pineapple. While scientists at the National Beer Yeast Laboratory in Sheboygan, Wisconsin say that no other brewing yeast strains are expected to be impacted by this shortage, that's little consolation to brewers who aren't interested in using lab-created strains. 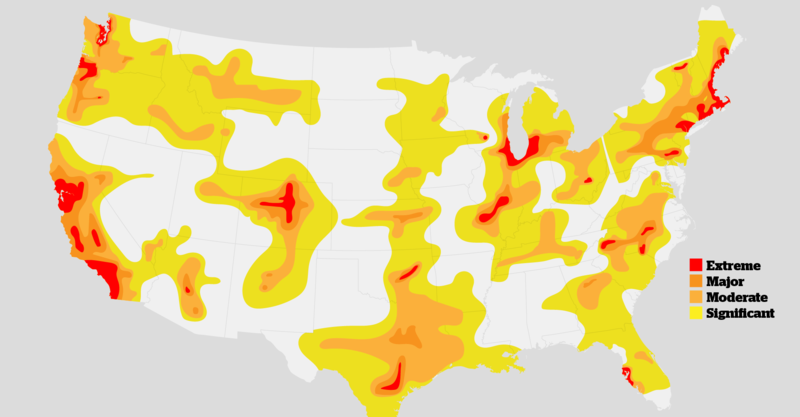 Significant Brettanomyces shortages are expected across the US, with extreme shortages impacting a number of regions. Map by Jamie Bogner. "Right now, we've stopped all other operations at the brewery and everyone, from folks on the packaging line to our accounting department, is out in the yard, at local farms, and on the side of highways hand scooping air into jars in the hopes of getting the last bit of Brettanomyces," explained Rob Tod, founder of Allagash Brewing in Maine before rushing this reporter off the phone to try and grab some Brett at a local gas station. The brewery's popular Brett IPA will be brewed in the interim with generic ale yeast, said Allagash Marketing Director Jeff Pillet-Shore. "It'll be just another clean IPA in a sea of IPA." Brandon Jones, the brewer and blender at Tennessee's Yazoo Brewing Co. and the creator of Embrace the Funk, was so despondent that he struggled through a telephone interview. "All of our funky beers are now going to be made with Chico yeast. I mean, there's nothing funky about Chico." Yazoo recently installed a coolship in its downtown Nashville location and, rather than letting it sit dormant during the Brettanomyces shortage, Jones said it would be filled with water and rented out for toddler swim lessons. "We have to pay this thing off," he said. "Brett or no Brett, the bank doesn't care." Grossman talked about his early homebrewing days and his hope for the future of his family owned brewing. He also shared his thoughts on the the latest trends and reminds brewers to embrace science, not just art when it comes to making beer.